Website ranking is a very common term in today’s online marketing. It reflects your online status, attracts the organic link building, drives more traffic to the website and helps it to maintain its position in the hash competition. The websites with higher ranking simply entertain their website authority that represents their reputation, resourcefulness, and high value to the end user. Other than the SEO there are many tools are being practiced in online market to rank the websites’ status. And Alexa ranking is the leading name among them. In this article, we are going have some basic information about it and explore the methods of improving your Alexa ranking quickly. 1 What is Alexa ranking? 2 What is the need of increasing the Alexa ranking? Alexa.com is the subsidiary website of Amazon.com that provides very important information relating to measuring the traffic on a website. Alexa ranking is the very popular among the bloggers and they regularly check it as it’s ranking for a website is based on the site popularity and a number of visitors and backlinks. But it measures the ranking on the basis of the number of users visiting the website, who have installed the Alexa toolbar. Alexa.com came into the existence in 1996. In its starting period, it was able to gather the data collected from Alexa toolbar. By the change of time, many other features were added as the measures of estimation of Alexa traffic estimation. Today Alexa ranking presents the right picture about your website’s popularity station based on the detailed information. What is the need of increasing the Alexa ranking? Your Alexa ranking is the scale of popularity of your blog post or web page content. And the webmasters, advertisers and internet experts to who wants to judge the relevance and worthiness of your post for their linking, often follow the Alexa ranking. A website with a good Alexa rank must be the site with good visitors’ traffic and the regularly updated content. And when it comes to the ad pricing on your blog post or web page, it simply improves your bargaining power. Once you manage to have good Alexa website ranks, you gain the trust factor and the advertisers also prefer to go to the blog or page with this trust factor. It directly improves your website’s exposure; it informs the potential advertisers and other webmasters about your online value. With a good ranking, you can attract some very good advertising offers and can bargain on your conditions. It generates the cycle of getting the advertisements, traffic and the rankings on the same hand. With a higher Alexa ranking, the advertisers easily get attracted towards the website. And the increased traffic will improve the website’s ranking similarly. This ranking works same with blogs and web pages. With the help of Alexa ranking, the webmasters get the vital and detailed information about the viability of your website. All these information helps to create the trust and the webmasters are inspired to get linked with your website or web page. Let’s get an idea about the techniques and factors that can be applied by the bloggers to achieve better Alexa rankings quickly. This technique is the first condition for the bloggers wishing the improved Alexa ranks. Your content must be developed with a great quality and informative uniqueness. Search engines love the quality content stuff and also this will boost your website traffic. A good content is the driver of quality traffic towards your website and supports your claim for the higher ranks on SERPs as well. While Alexa ranking is directly concerned with the visitors’ traffic to a website, by attracting more traffic one can improve the opportunities to rank higher. It is advised to apply the Alexa search analytics tab on Alexa toolbar, that will keep you informed about the changing status of traffic driven by your website. Writing the guest posts technique is the smart way to build the good amount of backlinks. The increased number of backlinks will directly reflect in the improved Alexa ranks. And the better ranks will further improve the number of backlinks. Don’t forget that writing blog post also requires the first condition of content quality to be fulfilled. There are many other ways to build backlinks such as commenting on the other websites and same like it, that can really help you get linked with many websites and ultimately it will give the positive impact on the overall website traffic and also the Alexa ranking. If you tend to write more and regularly, you will be able to meet the regularity requirements of Alexa ranking. Actually, the regular posting is the backbone of the process of getting better traffic. Nobody likes the old or dead content. The regular supply of fresh and interesting information helps in gaining the readers’ preference and better linking. For the new bloggers it is advised to write 2 to 3 blogs per day, but do not compromise with the quality. The results will be visible on the improved Alexa ranking. It is also an important way to increase the Alexa ranking. If you have the Alexa widget on your blog or website, it will keep you informed about the Alexa ranking status of your blog or website. For this, you need to register your blog or website to Alexa.com and paste the code in the source code in your source code. Since 1996, when Alexa ranking was first introduced to the web universe, it was the best way to find the ranking status of the websites. Today, the time has been changed, but still, when the users visit your website through the browser with the Alexa toolbar, it proves very helpful. If you install this toolbar in your browser, this will definitely benefit you. 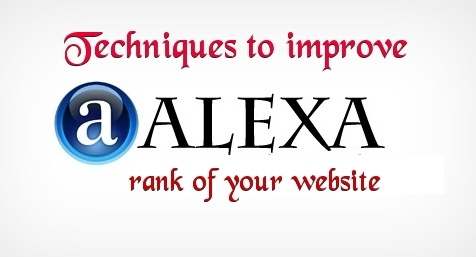 These Alexa rank tips are very useful and it also works. Everybody should try it. This Alexa improving blog is awesome and their information is really useful and informative. Keep it up. Good job. Keep updating new blogs.